Seventy-five years ago, Fifth Air Force units set out to strike the Japanese stronghold of Rabaul. Artist Steve Ferguson illustrated one moment of that mission below. This print was first shared last year. On November 2, 1943, Fifth Air Force launched a massive low-level attack by B-25 strafer-bombers against harbor installations and shipping at the major Japanese fleet anchorage and base at Rabaul, New Britain. In the vanguard of the 71st Squadron’s strike, 1/Lt. James A. Hungerpiller flying SLEEPY TIME GAL and 1/Lt. J. E. Orr can be seen engaging their targets at mast-top heights. In the face of the hundreds of antiaircraft guns, Lt. Hungerpiller opened fire on two destroyers, scoring a direct hit with one of his bombs. Meanwhile, Lt. Orr opened fire on a harbor merchant ship while Lt. Hungerpiller’s aircraft quickly began to lose altitude because of severe AA damage. Recognizing the plight of this aircraft, he made a sharp right turn toward to heavy cruisers anchored just off the western shore of the harbor. This painting depicts Lt. Hungerpiller’s SLEEPY TIME GAL, trailing a plume of fire and smoke, crossing beyond the bow of the heavy cruiser Haguro. In the foreground, Lt. Orr is opening fire on the Japanese merchant ship. With his left engine on fire and the aircraft severely damaged from a fuel tank explosion, Lt. Hungerpiller soon lost control his aircraft and plunged into the sea. This painting, part of a limited edition series by Steve Ferguson, can be purchased on our website. On November 2, 1943, the Fifth Air Force launched a massive low-level attack by B-25 strafer-bombers against harbor installations and shipping at the major Japanese fleet anchorage and base at Rabaul, New Britain. In the vanguard of the 71st Squadron’s strike, 1/Lt. James A. Hungerpiller flying SLEEPY TIME GAL and 1/Lt. J. E. Orr can be seen engaging their targets at mast-top heights. In the face of the hundreds of antiaircraft guns, Lt. Hungerpiller opened fire on two destroyers, scoring a direct hit with one of his bombs. Meanwhile, Lt. Orr opened fire on a harbor merchant ship while Lt. Hungerpiller’s aircraft quickly began to lose altitude because of severe AA damage. Recognizing the plight of this aircraft, he made a sharp right turn toward to heavy cruisers anchored just off the western shore of the harbor. On May 29, 1945, 1/Lt. Fred L. Paveglio and his wingman, 1/Lt. L.T. 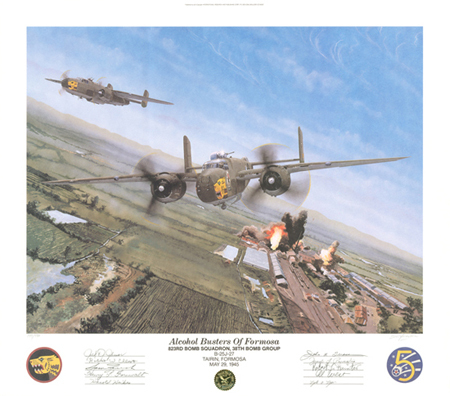 Wilhelm, piloted their B-25J Mitchells on a devastating raid against the Tairin Alcohol Plant on the island of Formosa. Following the precise directions from the navigator, 2/Lt. Albert C. West, Paveglio and Wilhelm dropped down to attack height and heavily strafed the Tairin complex, just before dropping a half dozen 500-pound parademos. To learn more or purchase a copy of this print, visit our website. 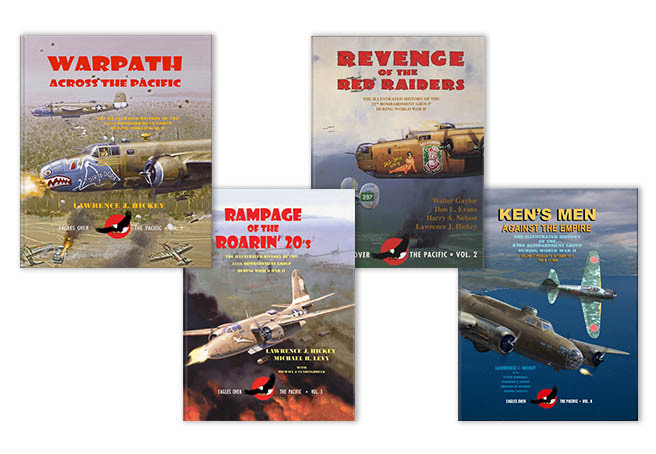 We are now selling 38th Bomb Group limited edition prints through our website. 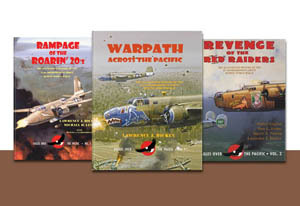 The prints illustrate the famous raids on Dagua Airdrome (Wewak) on August 18, 1943; the daring attack by the 5th Air Force on the Japanese bastion at Rabaul on November 2, 1943; the vicious ordeal over the Japanese reinforcement convoy at Ormoc Bay, Leyte, on November 10, 1944; and finally the devastation attacks on the Japanese fuel alcohol industry on Formosa, represented by the raid on Tairin on May 29, 1945. One of the four prints now up for sale on our website.